The owner of Jeffery Plaza, Shervin Mateen, said Tuesday that his company Cannon Commercial was close to signing a lease with Pueblo Supermarkets of Puerto Rico to take over the former Dominick's store in South Shore. THE LOOP — The owner of Jeffery Plaza said it has found a tenant for the vacant Dominick’s in South Shore. Shervin Mateen, the owner of the shopping center at 71st Street and Jeffery Boulevard, said a deal is close to being finalized with Pueblo Supermarkets of Puerto Rico and the U.S. Virgin Islands to fill the space Dominick’s left vacant on Dec. 28. 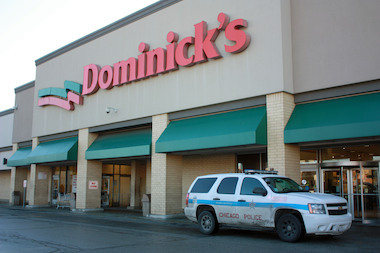 “It’s at the signature stage right now,” Mateen said, adding that the lease was already prepared for the store to reopen in May when the former Dominick’s lease ends. He said the new grocer would not pursue any of the tax benefits the city has offered as incentives to get a grocer into the space. But Ald. Leslie Hairston (5th) said she was skeptical that the deal was as far along as Mateen claimed. She met with the Jeffery Plaza owners on Friday, she said, and at at the time they did not mention Pueblo Supermarkets, which she said had a questionable record. Hairston pointed to a 2010 report in the Virgin Island Daily News about the Pueblo owner, Chicago resident Ahmad Al Khatib, who prosecutors accused of stealing $1.3 million worth of electricity for his four Virgin Island stores. Under a plea deal, Al Khatib pleaded no contest to tampering and illegal use of utility equipment and agreed to pay a $12,000 fine and provide additional community services, according to the newspaper. A lawyer for Al Khatib could not be reached for comment. Mateen said he was unaware of the case. 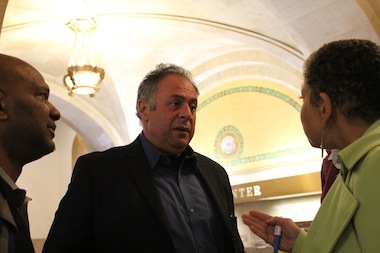 A representative for Mateen made the announcement during the public comment section of a meeting of the Chicago Community Development Commission, which was debating whether to give the city authority to acquire the South Shore property through eminent domain or other means. The commission voted in favor of granting the city the authority to acquire the property, sending the measure to the City Council. Mateen predicted the city would back down on eminent domain. "This is not going anywhere, we are going to be the owners," Mateen said.